Well Dad finally got out of the R.A.F just before the end of the war and received a letter from the King thanking him for his help in the war; a standard letter of course but one it felt good to look at I have been searching for it but alas I cannot find it. 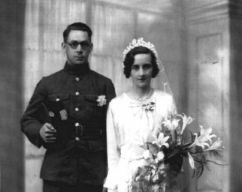 And here is a Picture of him and Mother I found and that took some doing to find that; it was taken in Portsmouth Hampshire UK in 1936 and when he came out just before the wars end he was an officer; I have got a pic of him as one but it will take some finding; but I shall post it as I understand a lot of a friend's Home health patients have been asking and indeed one has some stories of his own in Northern Idaho in the USA and I will post them if he wishes under his name of course but not until I have permission to do that. So I looked at his record of service and gosh he sure had been to a few places; all up he did twenty one and a half years. A varied career at that and he managed to get out of Singapore the day before British forces under the command of an Australian surrendered . So after reading these accounts years later I found he really was a lucky bloke to have evaded all that horror. I am very proud of his exploits which although normal were to a schoolboy truly remarkable; so I most likely blew them up a bit at school. School yes a place I don’t really want to discuss all the things I got up to not on my own of course.I do recall going to an Air Force base R.A.F Thorney Island to collect a few of my father’s things mainly his trombone from the officer’s mess there and being treated rather well seeing as I was only a boy. I got into the usual schoolboy scrapes like anyone else really and was really glad when Dad found employment with the Gloster Aircraft Company on a permanent basis as an inspector with them; and in the end we moved to a little place near the historical city of Gloucester. Now Gloucester was an old Roman city and in the centre of town was a cross roads all as straight as a die and at the bottom end of one a huge Fair or Carnival was held once a year; now if you went a little further to a place called Dymock The daffodils grew wild in the fields and it was hard not to tread on them; that is where I added to my pocket money (What pocket money) by picking and selling them by the bunch so I always did ok in the early spring moneywise. 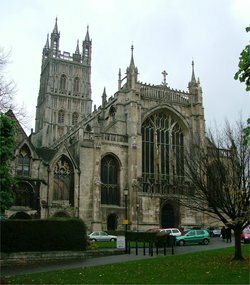 Gloucester was also really famous for its cathedral and cloisters; I took my late wife back there once in 1994 from Australia on the way home from a visit to the USA another story I think; suffice to say I really enjoyed myself there we both did. now Gloucester Cathedral so the story went had a tunnel (I have seen that.) and it went to an old Inn called the Monk's retreat well I went there as well but no link to the Cathedral either blocked up or an old tale; I am plumping for the latter myself. Still being on holiday I had a few beers, strangely enough I don't drink Alcohol now. More in another post.